CASE I. FUNCTIONS THAT ARE EVERYWHERE DIFFERENTIABLE. 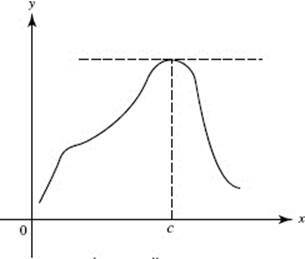 The following procedure is suggested to determine any maximum, minimum, or inflection point of a curve and to sketch the curve. (1) Find y ′ and y ″. (2) Find all critical points of y, that is, all x for which y ′ = 0. 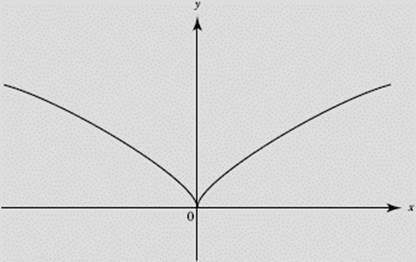 At each of these x’s the tangent to the curve is horizontal. (3) Let c be a number for which y ′ is 0; investigate the sign of y ″ at c. If y ″ (c) > 0, the curve is concave up and c yields a local minimum; if y ″ (c) < 0, the curve is concave down and c yields a local maximum. This procedure is known as the Second Derivative Test (for extrema). SeeFigure N4–2. If y ″ (c) = 0, the Second Derivative Test fails and we must use the test in step (4) below. c yields a local minimum. (4) If y ′(c) = 0 and y ″(c) = 0, investigate the signs of y ′ as x increases through c. If y ′(x) > 0 for x’s (just) less than c but y ′(x) < 0 for x’s (just) greater than c, then the situation is that indicated in Figure N4–3a, where the tangent lines have been sketched as x increases through c; here cyields a local maximum. If the situation is reversed and the sign of y ′ changes from − to + as x increases through c, then c yields a local minimum. Figure N4–3b shows this case. The schematic sign pattern of y ′, + 0 − or − 0 +, describes each situation completely. If y ′ does not change sign as x increases through c, then c yields neither a local maximum nor a local minimum. Two examples of this appear in Figures N4–3c and N4–3d. (5) Find all x’s for which y ″ = 0; these are x-values of possible points of inflection. 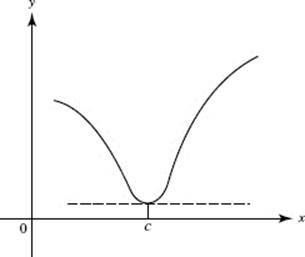 If c is such an x and the sign of y ″ changes (from + to − or from − to +) as x increases through c, then c is the x-coordinate of a point of inflection. If the signs do not change, then c does not yield a point of inflection. The crucial points found as indicated in (1) through (5) above should be plotted along with the intercepts. Care should be exercised to ensure that the tangent to the curve is horizontal whenever and that the curve has the proper concavity. 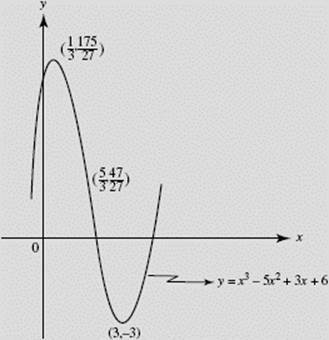 Find any maximum, minimum, or inflection points on the graph of f (x) = x3 − 5x2 + 3x + 6, and sketch the curve. (1) Here f ′(x) = 3x2 − 10x + 3 and f ″(x) = 6x − 10. (2) f ′(x) = (3x − 1)(x − 3), which is zero when or 3. (3) Since we know that the point is a local maximum; since f ′(3) = 0 and f ″(3) > 0, the point (3, f (3)) is a local minimum. Thus, is a local maximum and (3, −3) a local minimum. (4) is unnecessary for this problem. 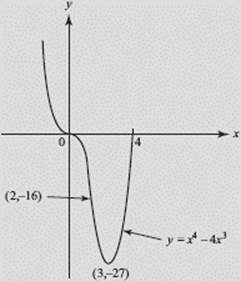 (5) f ″(x) = 0 when and f ″ changes from negative to positive as x increases through so the graph of f has an inflection point. See Figure N4–4. Verify the graph and information obtained above on your graphing calculator. Sketch the graph of f (x) = x4 − 4x3. (1) f ′(x) = 4x3 − 12x2 and f ″(x) = 12x2 − 24x. (2) f ′(x) = 4x2 (x − 3), which is zero when x = 0 or x = 3. (3) Since f ″(x) = 12x(x − 2) and f ″(3) > 0 with f ′(3) = 0, the point (3, −27) is a relative minimum. Since f ″(0) = 0, the second-derivative test fails to tell us whether x = 0 yields a maximum or a minimum. (4) Since f ′(x) does not change sign as x increases through 0, the point (0, 0) yields neither a maximum nor a minimum. (5) f ″(x) = 0 when x is 0 or 2; f ″ changes signs as x increases through 0 (+ to −), and also as x increases through 2 (− to +). Thus both (0, 0) and (2, −16) are inflection points of the curve. The curve is sketched in Figure N4–5. Verify the preceding on your calculator. CASE II. FUNCTIONS WHOSE DERIVATIVES MAY NOT EXIST EVERYWHERE. 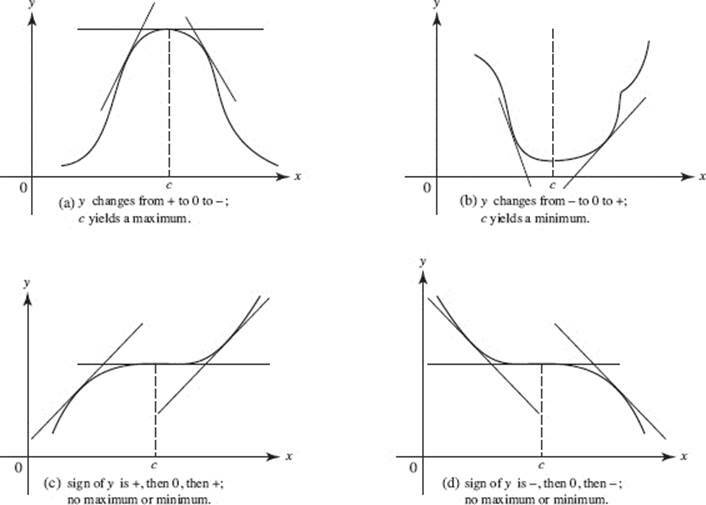 If there are values of x for which a first or second derivative does not exist, we consider those values separately, recalling that a local maximum or minimum point is one of transition between intervals of rise and fall and that an inflection point is one of transition between intervals of upward and downward concavity. Sketch the graph of y = x2/3. Neither derivative is zero anywhere; both derivatives fail to exist when x = 0. As x increases through 0, changes from − to +; (0,0) is therefore a minimum. Note that the tangent is vertical at the origin, and that since is negative everywhere except at 0, the curve is everywhere concave down. See Figure N4–6. Sketch the graph of y = x1/3. As in Example 14, neither derivative ever equals zero and both fail to exist when x = 0. Here, however, as x increases through 0, does not change sign. Since is positive for all x except 0, the curve rises for all x and can have neither maximum nor minimum points. The tangent is again vertical at the origin. 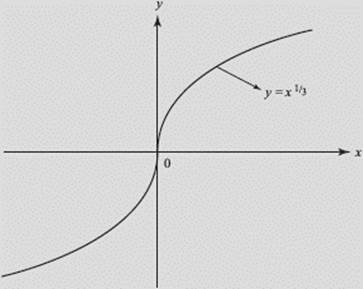 Note here that does change sign (from + to −) as x increases through 0, so that (0, 0) is a point of inflection of the curve. See Figure N4–7. Verify the graph on your calculator.